Buford Betty: Our sweet boys are here! Congratulations!! I have been a follower of your blog for a while. I am looking forward for you to share stories about the twins. My daughter in law is due with twin girls in early December. I pray all goes well with the boys and you can have them home soon. Congrats! I am glad to hear they are so big! My friend just had a baby who weighed a POUND at birth so they seem huge in comparison. I cannot wait to hear more! Congrats! Welcome Ben and Leo. Hope you're feeling good! Congratulations! 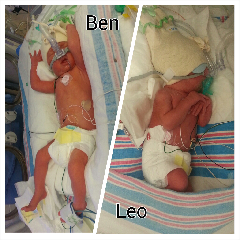 Our nephew and his wife just had twin girls @ 34 weeks, so maybe I can fix Ben and Leo up in 18 or so years! I will keep you all in my prayers. I know that you are looking forward to holding your sweet babies! Please keep us posted - your blog followers miss you!!! So thrilled to hear your news and happy you all are doing well. Congratulations! Congratulations on your boys arrival, hope all is well! Congrautlations on the arrival of your boys, hope all is well! I've followed your blog for awhile now (I was an RBA patient too) and hope that those sweet boys are doing well! I check back often for updates, but please know I'm thinking about you and hope that life with all 3 of your boys is fabulous!